The main difference between packed column and capillary column is that, in a packed column, the stationary phase is packed into the cavity of the column whereas, in a capillary column, the stationary phase coats the inner surface of the cavity of the column. 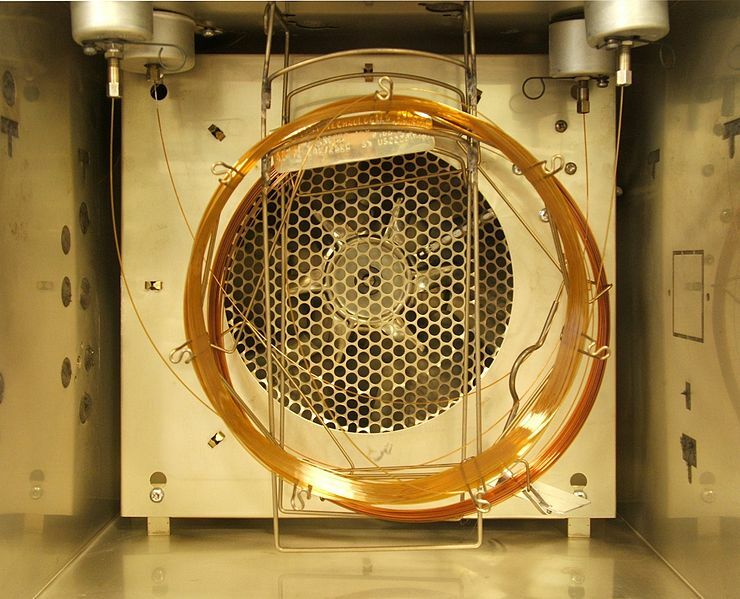 Furthermore, we mainly use packed columns in liquid-liquid extractions and capillary columns in gas chromatography. Packed column and capillary column are two types of columns used as the stationary phase during chromatographic extractions. Stationary phase is the fixed phase of the chromatography through which the mobile phase carries the components of the mixture. Packed columns are a type of columns in chromatographic techniques. They contain a fully-packed stationary phase made up of fine particles. Therefore, this increases the pressure inside the column. Also, because of this, the packed columns are shorter in length in comparison to capillary columns. Furthermore, the three components of a packed column are the tubing, packing, and the end plugs. The packing or the stationary phase is either solid or liquid. In the case of liquid stationary phase, the liquid phase coats the fine particles. On the other hand, the solid stationary phase is simply a packing of fine particles and there is no liquid phase covering the particles. Moreover, there are three types of separations in packed columns: distillation, gas absorption, and liquid-liquid extractions. Generally, most of the older methods of chromatography used packed columns. Because, they give a better separation of light gases. Also, a number of selective stationary phases comes with packed columns. In addition, packed columns are less expensive when compared to capillary columns. Capillary columns are another type of columns in chromatography. Other names for capillary columns are wall-coated open tubular (WCOT) columns or porous layered open tubular (PLOT) columns. Here, the stationary phase only coats the inner surface of the tube and a polyimide layer serves as the stationary phase. So, the whole column is not packed with the stationary phase. The polyimide layer has a characteristic brownish color. Capillary columns require a small amount of sample. On the other hand, the pressure generated inside the column is also less. They are a widely-used type of column nowadays due to their high resolution and efficiency. Packed column and capillary column are two types of stationary phase in chromatographic separations. 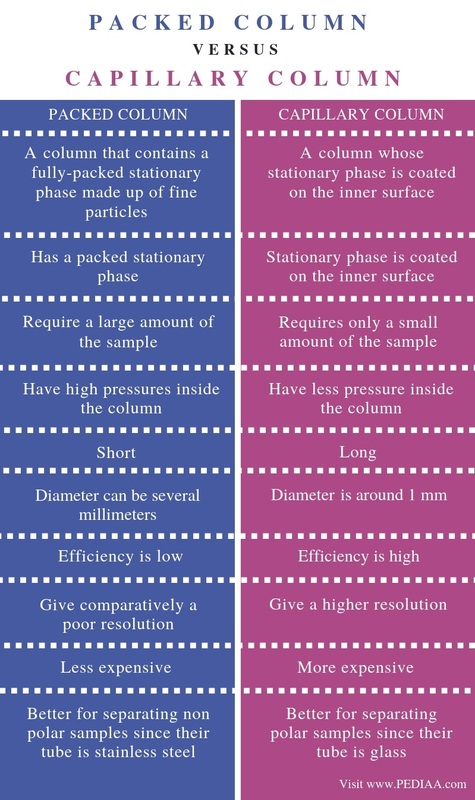 Both can be used in the gas chromatography (GC). Also, the main function of both these columns is to retain the components of the mixture that are to be separated in the column. Hence, columns provide a medium for the separation of the components in the mixture. 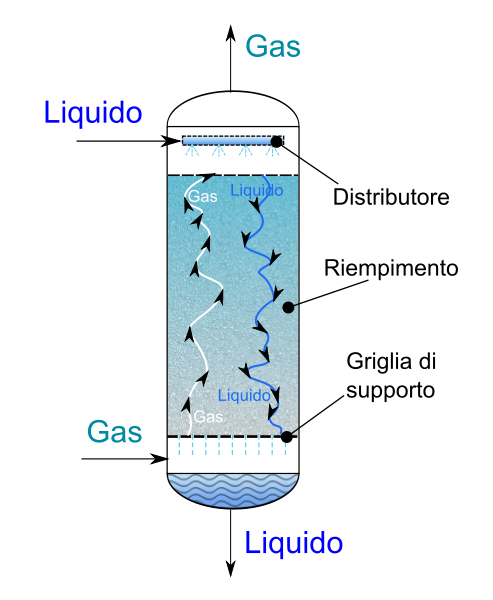 A packed column refers to a column that contains a fully-packed stationary phase made up of fine particles. In contrast, a capillary column refers to a column whose stationary phase is coated on the inner surface. Packed columns has a packed stationary phase while the stationary phase of the capillary column is coated on the inner surface. This is a major difference between packed column and capillary column. Another difference between packed column and capillary column is that the packed columns require a large amount of the sample while the capillary column requires only a small amount of the sample. Moreover, the packed columns have high pressures inside the column. But, compared to the packed columns, the capillary columns have less pressure inside the column. Another difference between packed column and capillary column is their length. Packed columns are short while capillary columns are longer. Furthermore, the diameter of the packed columns can be several millimeters while the diameter of the capillary columns is around 1 mm. Efficiency creates another difference between packed column and capillary column. The efficiency of the packed columns is low while the efficiency of the capillary columns is high. Moreover, packed columns give comparatively a poor resolution while capillary columns give a higher resolution. Hence, this is also an important difference between packed column and capillary column. Packed columns are less expensive while capillary columns are more expensive. In addition, packed columns are better for separating non polar samples since their tube is stainless steel while capillary columns are better for separating polar samples since their tube is glass. Also, there is a difference between packed column and capillary column based on their ruggedness. Since the tube of the packed columns is made up of metal, they are rugged while capillary columns are fragile since their tube is made up of glass. Packed column contains a fully-packed stationary phase. On the other hand, capillary columns are another type of column with an inner surface coated with the stationary phase. Capillary columns give a better resolution and an efficient result though they are expensive. Therefore, the main difference between packed column and capillary column is the type of packing of the stationary phase.